Welcome to Meghan's Dog Page, make yourself at home! This page is just the introduction, but if you want to go to more fun and exciting pages, go to the links on the left. Hi, my name is Meghan. My favorite dog is a German Shepard and next after that is a Welsh Corgi. I'm the creator of this whole webpage! This webpage is about dogs and some of it is about my three dogs. There names are Allie, Molly, and Brooklyn(you can call her brook for short). I also have 4 cats, 2 are girls and 2 are boys. The girls are Bell and Rascal. I use to have another girl(pascal), but she died. We had to put her to sleep because she was suffering from cancer. Our boys are zeus and storm. Storms thinks he's the ruler of all the cats, he's really big and we named him storm because he's gray. I also have a hampster(a girl, her name is Reggina, reggie for short. And a bird(a boy, his name is charlie, but my friend calls him Narlie charlie,lol). If you want to learn more about my dogs, click on the link to the right that says "My Dogs". Well, thats the whole gang, have fun in my website! Every month I will have a trivia question and at the end of the month I will tell you which one it is. So go ahead and vote. Remember, you can find the answers in the pages to the left. Feel free to place any of these banners on your page, on one condition, you have to link it back to my page. 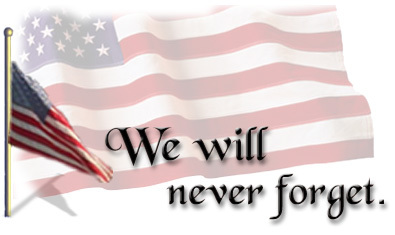 We will never forget about what happened and will always remember those who have died. Click here to vote for me in the Top U.S.A. Sites! 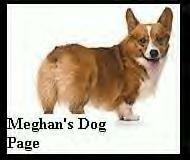 This graphic is from Kippers Corgi Hysteria, If you want to go there, click on the link below. Line dividers made by Corgi Dog House. Click on the graphic to go there.